Does Summer Vacation Planning Raise Problems for You? Q: My husband and I are at odds over visiting his family in Florida. His mother has remarried (his father died years ago) and her husband is impossible to be around. He is constantly criticizing me and the kids, and when we visit I have a terrible time. My husband says I am overly sensitive and should just “let it go,” which is how he handles his family. Am I obligated to keep going on visits when they make me miserable? What about our teen-aged kids? Is there any way to resolve this without taking separate vacations from now on? A. Perhaps you don't have enough information to make an intelligent decision. Try these approaches in the following sequence. The first step is to ask your husband to talk to you about the importance of your participation in the trip. Gently inquire about his values, interests and concerns involved in your going. Do not rebut any of his explanations. Simply recap the facts and feelings of what he says as your “interview” progresses. One of the goals of this discussion is for you to truly hear him and to let him know that you hear him. When you both think you understand his whole story, then let the discussion percolate for a while and think about whether you can go as a loving gift to your husband. Give this some honest consideration. If this is more than you would like to bear, then apply the second step. Tell your husband you would like to have another discussion about the situation. This time describe to him your concerns and values and ask him to recap without judgments like you did for him in the first discussion. When you both believe you are understood, then you are ready for the next phase. Start by making a suggestion that works for you and might work for him. Try to think beyond mere logistical solutions like, “You go, I'll stay home.” Maybe you could suggest that your husband writes a letter to his mother saying the visits would be even more pleasant if comments about certain topics were omitted. Then point out why your suggestion works for you and, more importantly, why it might work for him. He responds by either agreeing with your proposal or explaining what part of the proposal sounds good and what part he objects to. Then he offers a suggestion that works for him and he tells why he thinks this suggestion might work for you. Repeat the process until you both reach a satisfactory agreement. By making suggestions that incorporate benefits for both partners, you avoid the two most common negotiating mistakes couples make: 1) stubbornly pushing for your own interests or 2) quickly caving in for the sake of avoiding tension and keeping the peace. Whatever agreement you reach, try it as an experiment rather than a permanent solution. These interchanges might seem stilted and awkward at first, but you are learning important listening and negotiation skills which will open the way for you to solve this problem and many others. In-law problems can be corrosive and they are about as common as dirt. But if you both can find a way through this one you have given yourselves a great gift. You also set a terrific model for your children about how to deal with conflict. 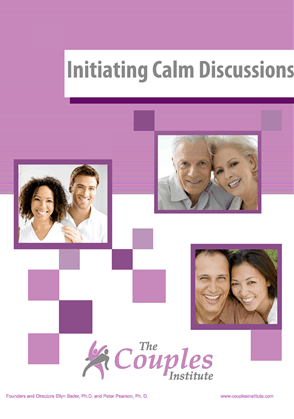 The foundation of this exercise is a new way of listening – without judgment, defensiveness, or jumping to conclusions. Listening to your partner with curiosity, compassion, and openness is an invaluable skill in maintaining a healthy relationship. Whatever your plans, it's summertime, so make time for some fun together. Pete has been training and coaching couples to become a strong team since 1984 when he co-founded The Couples Institute with his psychologist wife, Ellyn Bader. Their popular book, “Tell Me No Lies,” is about being honest with compassion and growing stronger as a couple. Please enter your name and email address to receive our free articles on how to improve your relationship. © 1984-2019 The Couples Institute. All rights reserved. You may not reproduce or use any of the text,images or other content appearing on this page or website, nor may you use any of the trademarks, without written permission from The Couples Institute.